Matthews, North Carolina (June 24, 2013) – CEM Corporation, a leading global provider of microwave laboratory instrumentation is pleased to announce the introduction of a new family of products that significantly alters the paradigm of peptide synthesis from early discovery through pre-clinical studies. The Liberty Blue™ line of research scale microwave peptide synthesizers and the Liberty XL™ mid-scale microwave peptide synthesizer were given an enthusiastic reception by attendees of the 23rd American Peptide Symposium in Waikoloa, Hawaii on Sunday, June 23rd. The Liberty Blue technology allows for 4-minute cycle times and a 90% reduction in solvent usage compared to existing methods for making peptides. The technology represents significant advances in hardware design, as well as remarkable improvements to the chemistry, resulting in greater speed and flexibility, better peptide purities and yields, and improved reliability. “Cycle times are 10 times faster than current microwave synthesizers, allowing chemists to make a normal peptide in less than an hour. In addition, even with the fast cycle times, these new microwave peptide synthesizers produce peptides in unparalleled purities,” Collins continued. 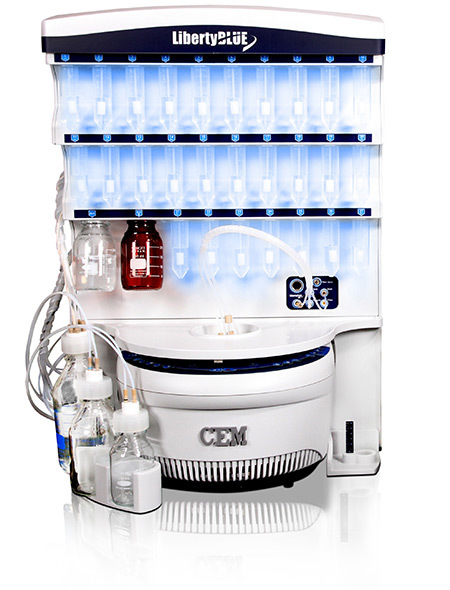 The systems’ patent-pending Flex-AddTM Technology provides infinite volume delivery with a high degree of accuracy and precision, allowing the Liberty Blue line coverage of a wide scale range from 0.025 to 5 mmol, the broadest range of any line of research scale microwave peptide synthesizers. In addition, the chemistry is directly scalable up to 100 mmol with the new Liberty XL. Designed for maximum speed, efficiency, and ease-of-use, the Liberty Blue line of microwave peptide synthesizers consists of manual, automated, and high-throughput systems, while the Liberty XL is an automated mid-scale system. The systems feature CEM’s patented technology for using microwave energy for both the coupling and deprotection steps of the synthesis, ensuring higher purities and yields faster than ever before. “We expect Liberty Blue and Liberty XL to have an even greater impact on peptide synthesis than the introduction of our original microwave peptide technology, which has become the method of choice for many researchers. These new products will give chemists the opportunity to once again push the boundaries of peptide synthesis,” concluded Collins. CEM Corporation, a private company based in Matthews, North Carolina, is the leading global company specializing in scientific solutions for critical laboratory applications. The Company has subsidiaries in the United Kingdom& Ireland, Germany, Italy, France, and Japan, as well as a global network of distributors. CEM designs and manufactures systems for bioscience applications, life sciences, analytical laboratories and processing plants worldwide. The Company's products are used in many industries including pharmaceutical, biotech, chemical, and food processing, as well as academic research. For further information, please contact CEM Corporation: Grace Vanier, Life Science Product Manager, Email: grace.vanier@cem.com Tel: (704) 821-7015 ext 1231 or Michelle Horn, Marketing Manager, E-mail: michelle.horn@cem.com, Tel: (704) 821-7015 ext 1220.